Oh, how I love a holiday that encourages folks to make and give food to one another. Perhaps this is my favourite thing about Valentine’s Day. When I want to show someone that I love them I usually find myself in the kitchen – preparing some sort of delicious treat. 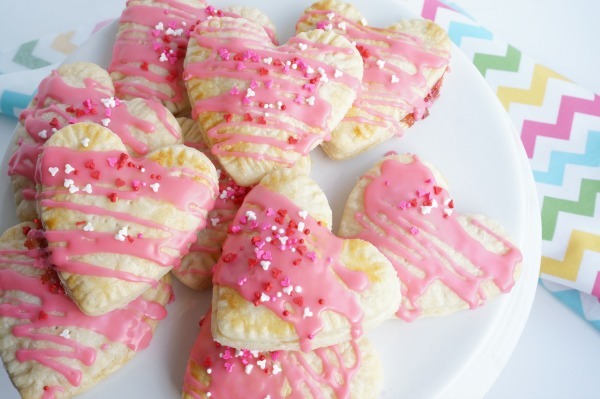 These adorable Valentine heart strawberry pop tarts are Valentine’s Day perfection. How cute are these little hand pies?! We filled our flaky pastry with strawberry jam, but feel free to substitute in your loved ones favourite jam. The key is adding corn starch to the jam…this keeps the jam from leaking out the seams. When I baked this batch of pop tarts the response from my entire family was unanimous – OMG! That’s the exact reaction I was hoping for. 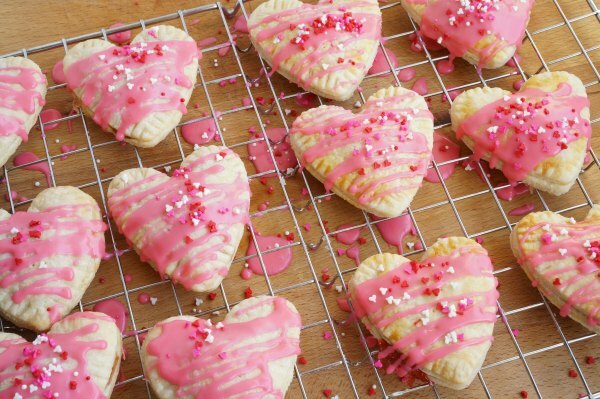 Who will you bake these Valentine’s Day treats for? Begin by making the pie crust. In a large bowl, whisk together flour and salt. Toss cold cubes of shortening into the flour. 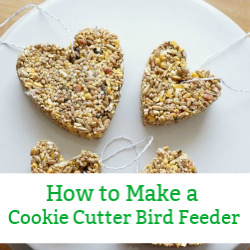 Use a pastry cutter to incorporate the shortening into the flour, until the shortening is small lumps (like small pebbles). Next, add the icy water. Add the water 1 tbsp at a time, until the dough comes together. The dough shouldn’t be sticky. Transfer the dough to a hard surface and shape into a large ball. Divide the dough in half and wrap the two halves in plastic wrap. Chill in the fridge for at least 20 minutes. Make the filling by stirring together the jam and the cornstarch. In a small bowl, whisk together the egg and 1 tbsp of water – this will be the egg wash. Remove one ball of chilled dough from the fridge. Roll the dough, on a lightly floured surface, to 1/8″ thickness. 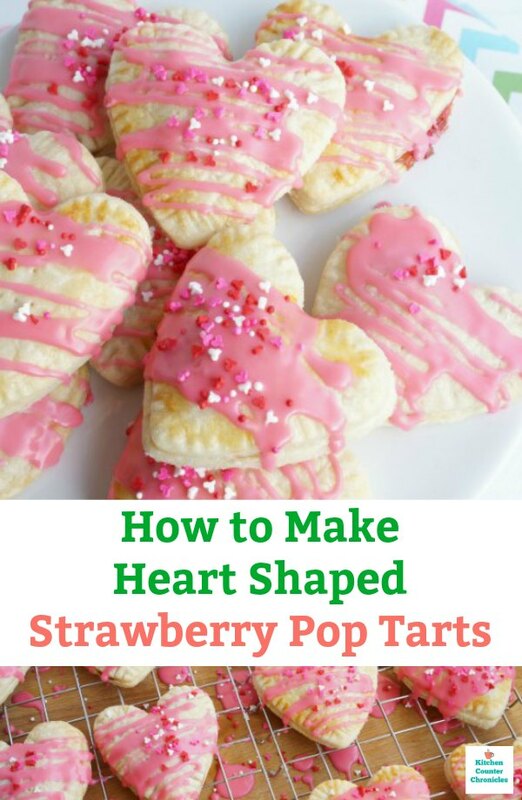 Use a large heart cookie cutter (mine is about 4″ long) to cut out the bottom hearts for the pop tarts. 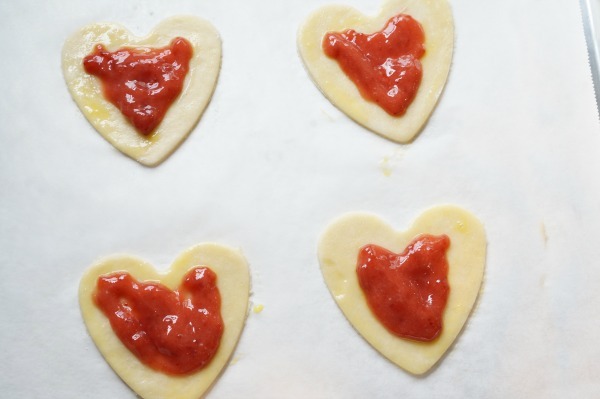 Once cut out, place hearts on a parchment paper lined baking sheet. 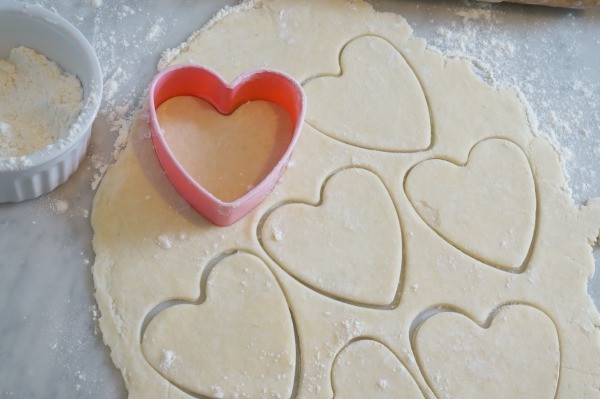 Roll out the second ball of dough and cut out an equal number of hearts. Let them sit while you fill the tarts. Use a pastry brush (or your fingers) to apply the egg wash to the edges of the bottom heart. Add about a tsp of jam to the centre of the heart. Spread it around, keeping it away from the edges of the tart. Place another heart over top of the jam. Use your fingers to press the edges closed and secure the jam inside. Press the tines of a fork around the heart, further sealing the jam inside. Use the fork tines to poke a series of venting holes in the top of each tart. Use the pastry brush to lightly coat the tart. Bake the tarts in a 400°F oven for 15-20 minutes – until the tops are lightly golden. Cool on a rack. Prepare the icing by stirring together the icing sugar and water. Add the water 1 tbsp at a time, until the icing reaches your desire consistency. 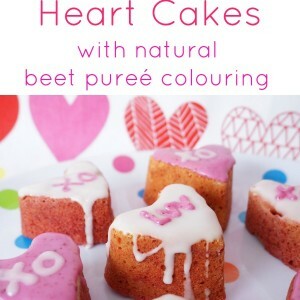 Add the red food colouring until it reaches a lovely pink colour…or leave the icing white. 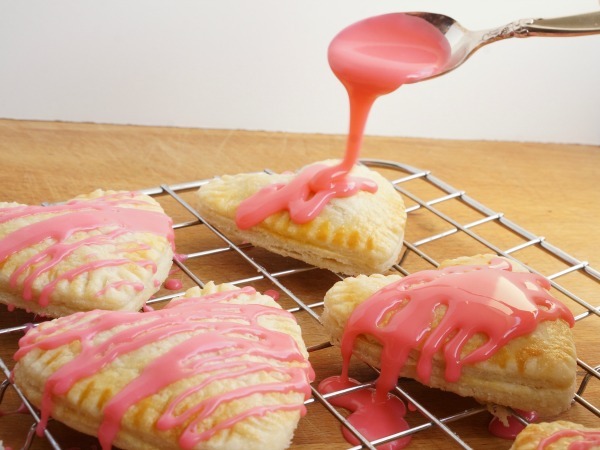 Once the tarts have completely cooled, use a spoon or fork to drizzle the icing onto the strawberry pop tarts. 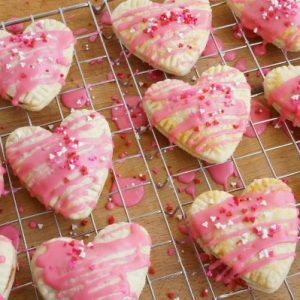 Sprinkle with Valentine candy sprinkles. Share with your friends and family. 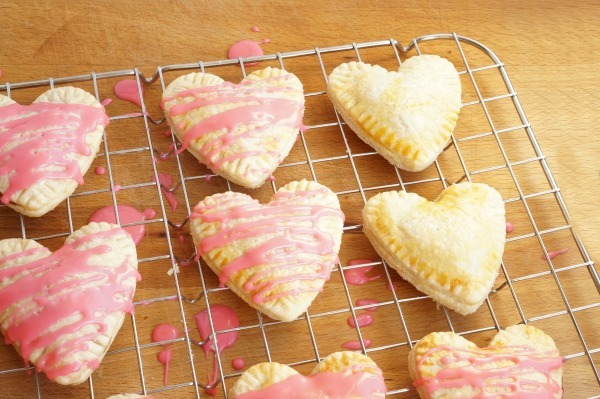 Bake a batch of heart shaped strawberry pop tarts to show your love on Valentine's Day. 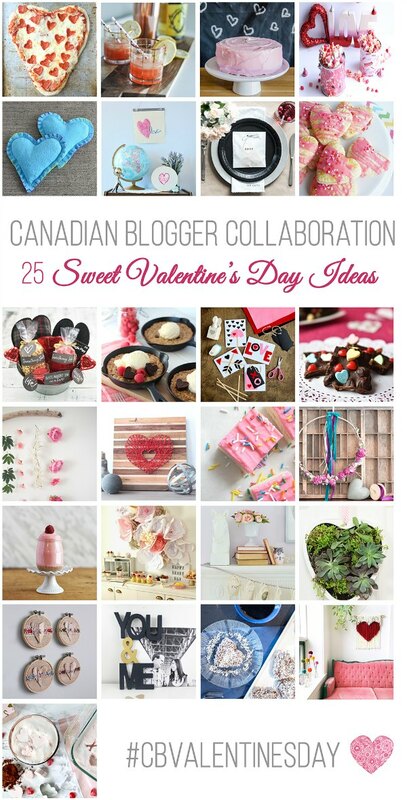 Today’s recipe is part of the fantastic 25 Sweet Valentine’s Day Ideas blog hop. 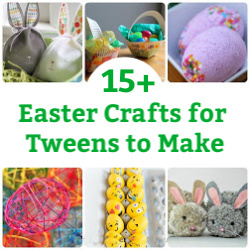 Be sure to check out all the other gorgeous crafts, decor and recipes being shared. There really are some beautiful projects to be discovered. 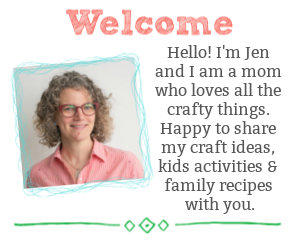 Hi Jen, how many cookies does this recipe yield? Want to make for my staff at work. So festive for Valentines Day. Depending on the size of your heart cookie. I made about a dozen pop tarts. Just the reaction you want from your family, right? These look and sound delicious! These are the cutest! 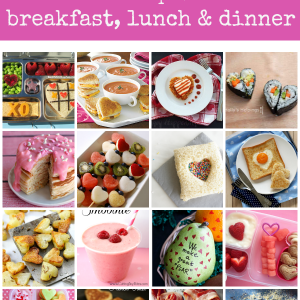 I too like to show my love through food…these are perfect for Valentine’s Day! These are so pretty! It’s funny, I was planning to make pop tarts this week, but I hadn’t thought of doing the heart shapes. It really makes them so festive. Love it! My kids would go crazy over these!!! My kids LOVED these! I’ve made two batches already. Little did I know when I opened this post I’d have tears in my eyes?! 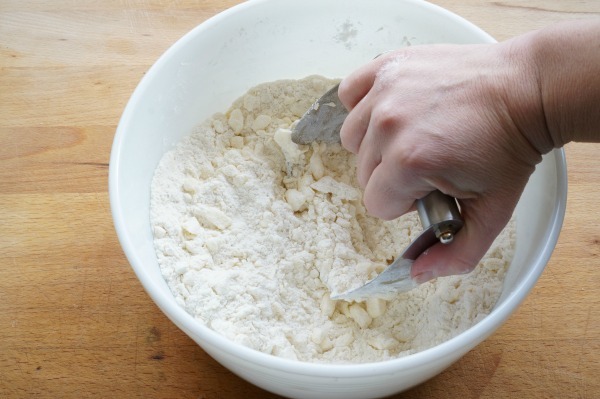 My Mom used to use a hand pastry mixer just like the one pictured… oh boy. 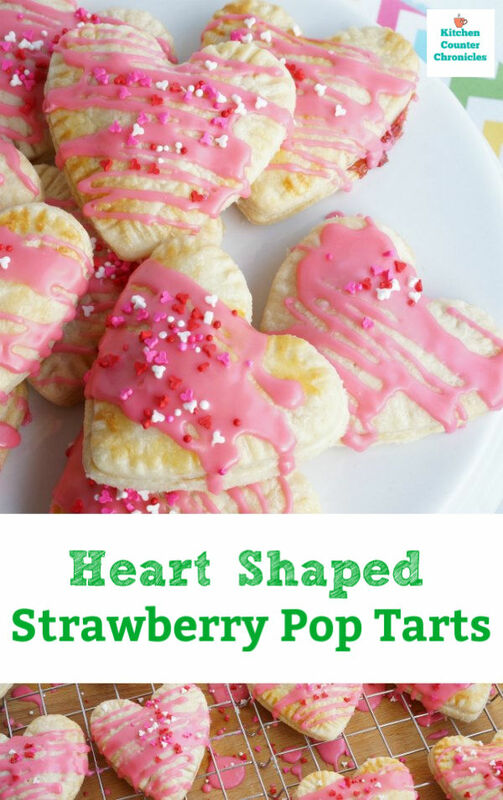 <3 And can I just say YUM the whole process has me wanting these pop tarts! Awe, I love my pastry cutter. It was my mom’s. What a lovely memory. These ALMOST too pretty to eat. Yummy! Nope…too pretty not to eat! These look so delicious and not to mention pretty! What a perfect little treat. Oh what I would do to eat some right now! Looks so good! These look amazing! Love the heart shape, the pink icing, the sprinkles. So perfect for Valentine’s Day! These are the sweetest idea, Jen!! Our kids love pop tarts and I cannot stand to buy the store ones!! I will have to try making these! Thanks for sharing! These look perfectly sweet and delicious. I’ve always wanted to make a jam filled treat and yours are just so pretty. I am going to try these out this Valentine’s Day! But I am short on time in the mornings so I will definitely be using the store’s puff pastry!